With record attendance of more than 300 construction IT professionals, the AGC IT Forum delivered another top-notch conference this year in Chicago. 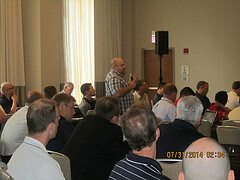 From big data to mobile apps to the ever-popular topic of affordable solutions, the two-day conference, held on July 30-Aug. 1, 2014, kept the ideas flowing and the excitement building. Clearly, the IT game is one everyone wants (and should) be playing. As noted in one session, IT in the construction industry is a freight train that can’t be stopped. And, in a competitive industry like construction, a collaborative event such as the IT Forum Conference keeps everyone on the same track. James Vaselopulos, senior vice president, PSC Group, LLC, led the train out of the station with his keynote address on Big Data. A frequently misunderstood topic, big data is not going anywhere and Vaselopulos demonstrated how construction professionals can and should leverage it effectively. 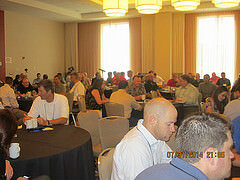 "@AGCIT Forum is for sure one of the most exciting tech events in construction industry." 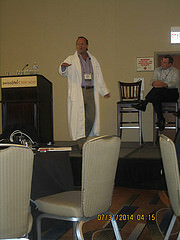 Self-proclaimed app guru Rob McKinney, J.M. Wilkerson Construction, led an informative session on apps and all they have to offer. McKinney even introduced participants to App Alchemy, a revolutionary tactic on connecting stand-alone apps, allowing IT professionals the opportunity to create their own enterprise-level solutions. "Just saw an excellent presentation by Rob McKinney @conappguru on #construction #apps at the @AGCIT #changingthegame #technology"
One of the many stand-out events at the IT Forum Conference was the session on Affordable Solutions, moderated by Howie Piersma, VP technology, Pepper Construction. This is an outstanding collaborative platform, where attendees shared solutions they’ve found valuable and sought answers to problems not yet solved. From ideas on solving connectivity issues in remote areas to video conferencing solutions to identifying a hotel’s wifi speed – the group covered it all. In a world where information technology is rolling down the track at high speed, it’s nice to hear the practical applications of the many options for construction professionals. James Benham, president, JBKnowledge, Inc., always gets the IT motor running. There’s no lack of passion with this guy and his love for gadgets is infectious. His session ran the gamut from what’s changed, what’s new, and what’s ahead. If it’s new in IT, Benham either had it on display or will be the first to try it out. From tech wearables to 4D models to drones, Benham covered it all. "Always blown away when I see @JamesMBenham speak. It’s been a great two days at the @AGCIT Forum." Additional highlights of the conference included a session on The Ups and Downs of Cloud Computing, presented by the IT Steering Committee panel; Construction Mobility Trends with William Tegethoff, AT&T Construction Solutions; an interoperability RFI demo by John Goecke, founder & COO, StratusVue, Todd Juhnke and Blake Hudson, project manager, Brasfield & Gorrie; and BIM – How to Stay Above it, by John Jurewicz, president, LTC Technologies. The Town Hall meeting closed up another great IT Forum Conference. When asked to reflect on the value of the conference, Rosemary Doerner, IT manager, Pinkard Construction Co., replied, "Excellent conference! I’m very glad I attended. All of the topics were relevant and full of information. And they did a great job of staying on schedule. Very well done – looking forward to the next conference." Others agree. First-time attendee Sam Lamonica, VP/CIO, Rosendin Electric, commented, "This was my first year at the AGC IT Conference and I’d like to tell you that it was definitely worth it. Good content and great networking." Lane Mitchell, chairman, IT Forum Steering Committee, extended his thanks to all involved in this year’s conference, "We enjoyed great collaboration, outstanding information and very successful networking with IT professionals in the construction industry." In addition to all the attendees, the AGC IT Forum Conference thanks its sponsors: Computer Guidance Corporation, Smart Use, AT&T, Soonr, Assemble, Kahua, .build, iSqFt, Textura, Coins, Nasuni, Note Vault, Pepper Construction, Mortenson and CMiC. To access presentations, click here: http://meetings.agc.org/it_conference/?page_id=826. This is an IT event not to be missed. See you at next year’s show!